It’s been a while since Katy Perry has done, well, anything really. The pop culture world has been dominated by a girl who likes to swing on heavy balls used primarily for demolition and a handful of sisters from LA who just can’t stay out of the sidebar of shame. However, a recent beef with Taylor Swift (apparently) and a little incident at one of her concerts involving a fan and her mobile phone have got people talking about her again. But we’re only interested in the latter. Said incident happened at the Melbourne chapter of her Prismatic Tour, and saw her whip one of her fan’s phones out of her hand while she was messaging her boyfriend. 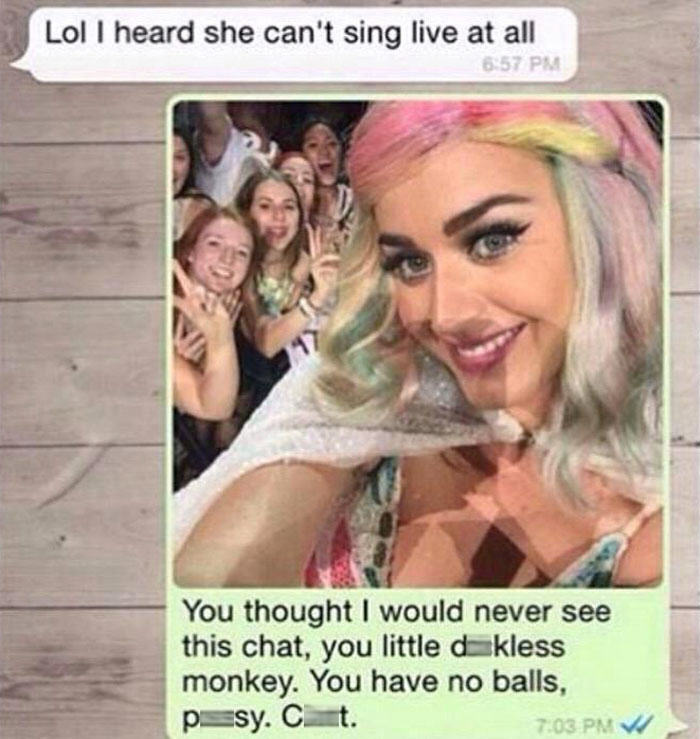 I’m not sure what exactly happened prior to this, but it turned out the dude was bitching about Katy Perry, and she wasn’t up for letting it go. I’m assuming he wasn’t expecting the response, which to be honest, if I was him, I’d have been extremely proud of. And yes, the message was received. Loud, clear and read.